The student clubs and organizations listed below exist within the College of Agriculture, Health and Natural Resources and provide students with excellent opportunities to become involved and meet others with similar interests. For more information, please click on the links below. If the club has a "UConntact" page link, there will be contact information listed on that page. For more information on how to join any of the organizations you read about, please contact the related academic department. If you are not sure which department to contact, please call the Academic Programs Office at (860) 486-2919. UConn has clubs and organizations for every interest - and if we don't, you can make your own club! Check out UConn clubs online through Student Activities. The mission of the Allied Health Sciences Club is to promote student participation in health care related activities, provide educational outreach to the campus community, participate in community service, and enhance career development. Visit the Allied Health Sciences Club 's UConntact page. Alpha Gamma Rho is an international fraternity interested in the promotion of agricultural and natural resource issues. The UConn chapter maintains an off-campus residential house where brothers can live. AGR is active in many programs sponsored by the College and the University. Visit the AGR website. Alpha Zeta is an honorary, professional society for students studying agriculture, environment, health, and related areas. AZ aims to recognize scholarship, enhance leadership, build character, and encourage fellowship. Members must place in the top 40 percent of their class. Activities include Cornucopia, Open House, Husky Ambassadors, and other university and community events. Visit Alpha Zeta's UConntact page. The UConn Student Sub-unit of the American Fisheries Society, Southern New England Chapter, strives to join persons interested in and/or involved in Fisheries Science. The sub-unit provides guidance, knowledge and leadership skills to future professionals while engaging students in conservation efforts for the local aquatic community, hands-on opportunities in the field, and fundraising efforts. Visit the American Fisheries Society's UConntact page. The Student Chapter of the American Society of Landscape Architects is an extension of the professional organization. The chapter is a link between students and those working in the profession. The chapter invites professional landscape architects several times each semester to present seminars on current events in the field. Each spring members get together with professionals for a charette, which is a brainstorming method of design. During a charette members break into small groups and come up with a design solution for the problem set before them. The chapter has gone on bus trips to study landscape architecture projects in New York City, Boston and other places. Visit ASLA's UConntact page. The Resource Economics Club is an organization of students interested in resource economics and agribusiness. Membership is open to all majors.The club sponsors educational programs on careers and internships, and also fosters friendships through social activities, sponsors guest speakers and provides members the opportunity to share pizza, meet friends, and have fun. Visit the Applied and Resource Economics Club's website or UConntact page. Immerse yourself in the endless world of hobby fish keeping! From maintaining a small betta bowl all the way up to C02 infused freshwater planted tanks and living reef aquariums, UConn Aqua-Life Club, has it all. They have fundraising events that allow them to plan and set up fish tanks of interest around campus and for possible student clients. Then they continue to maintain and care for these tanks throughout the school year. They also have trips to local aquariums, fish wholesalers, and local trade shows along with guest speakers. Their main goal is to educate UConn students on proper fish care and spread interest in the hobby! Visit Aqua-Life Club's UConntact page. The UConn Bass Fishing Team was established to introduce avid UConn bass anglers to tournament fishing and to be a resource for collegiate anglers and non anglers to learn more about the sport of bass fishing. The UConn Bass Fishing Team is part of the national organizations B.A.S.S. and FLW. Team members fish FLW College Fishing tournaments as well as local and regional B.A.S.S and FLW tournaments and team opens. Team members also have the opportunity to attend fishing expos, participate in fishing related community service, and team fundraising events. Block and Bridle Club members have the opportunity to participate in many horse and livestock activities. Each year the club sponsors and manages the Little International Livestock and Horse Show. Students may participate by fitting and showing sheep, cattle, swine, poultry or horses. In the spring, members may participate in a regional competition concerned with general knowledge in the animal sciences. This event provides members an opportunity to travel to other land grant universities in the Northeast. Visit Block and Bridle Club's website or UConntact page. 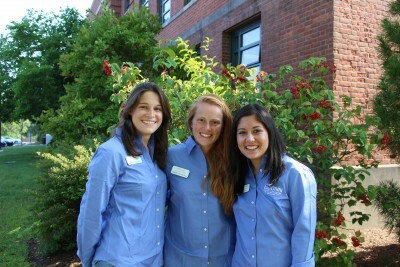 College Ambassadors are undergraduate students in the College of Agriculture, Health and Natural Resources (CAHNR) and the Ratcliffe Hicks School of Agriculture (RHSA) that assume a position of leadership and serve as advocates for the college. The Ambassadors participate in various recruitment activities, such as Open House, high school visits, and Cornucopia, as well as gain valuable leadership and professional skills. Visit the College Ambassadors website or UConntact page. The Dairy Club is an active student club, and members participate in several events, including the Dairy Club Fitting and Showing Contest. Students travel annually in November to the Royal Canadian Winter Fair in Toronto, Canada. Dairy Club members engage in several fundraising activities that include selling dairy and related products, such as collectible UConn milk bottles. Dairy Club members stay busy year-round with dairy-related activities, rounding out the college experience and having fun at the same time. Visit the Dairy Club website. 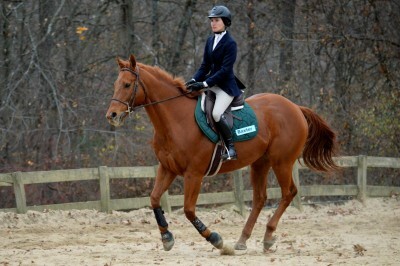 The Dressage Team allows students who have an interest in the riding discipline dressage to interact with one another. Dressage is a French term that means "to train". When Dressage is executed to the highest level, both horse and rider work together in effortless harmony. The club provides opportunities for members to compete against dressage riders from other colleges and participate in community service and clinics. Visit the Dressage Team website. The UConn Morgan Drill Team is one of the proud ambassadors to the equine program on campus. The team demonstrations are performed using pattern work accompanied by music that’s in the spirit of that day’s performance. The team meets once a week in the Department of Animal Science horse practicum to re-invent new patterns. The team has kept up the tradition of participating annually in many campus activities such as: Little International Livestock and Horse Show (Little “I”), Horse Symposium, Homecoming Parade, College of Agriculture, Health and Natural Resources Undergraduate Commencement, and has been invited in the past to perform at the Pfizer Fantasia at Equine Affaire (the largest equine event in the Northeast). Visit the Drill Team website. The EcoGarden Club encourages a sustainable approach to gardening and awareness of local foods produced with low environmental impact. The club operates a 1-acre campus community garden and strives to preserve soil integrity with compost, reduced tillage and crop rotation. Through water conservation and the use of non-synthetic soil amendments, the EcoGarden Club promotes environmental preservation. EcoGarden Club seeks to educate students and community members about incorporating these practices into their own gardens through garden days, trips to farmers markets and local farms, and a summer Community Supported Agriculture (CSA) program. Visit EcoGarden Club's UConntact page. Becoming a member of the UConn Equestrian team is an honor and an achievement. Riders learn good sportsmanship and commitment. The team is fused together through a tight bond of friendship. Tryouts are held at the beginning of each year (and sometimes semester when spots open up) in a "competition style" event. Equestrian Team members compete in many Intercollegiate competitions across the state, and even Zones/National/Tournaments farther away. For more information, call the Animal Science department at (860)486-2413. Visit the Equestrian Team's UConntact page or website. The Equine Club's mission is to unite all equine enthusiasts regardless of discipline and to further members' education and knowledge of the horse industry through extracurricular activities. Members do not have to have any prior experience working with horses in order to participate in activities. The group plans events such as talks, demonstrations, and equine movie nights. The club also hosts the Holiday Horse Photo Event for the community every fall in addition to planning equine-related trips to such places as the Belmont Racetrack and Aqueduct Racetrack. Visit the Equine Club's UConntact page. Members of the Forestry and Wildlife Club include students from a number of different majors who share an interest in the outdoors and natural resources. Activities have included hiking in an old-growth forest in the White Mountains of New Hampshire, bird walks and owl prowls at the UConn Forest, guided tours of Connecticut state parks and forests, and camping trips. The club also participates in UConn Forest projects including trail maintenance, tree plantings, wildlife habitat enhancement, and maple syrup production from our own sugar bush. Several meetings a year feature natural resource professionals who give presentations on environmental issues. The club provides members with the opportunity to gain experience and knowledge as well as have fun and make new friends. Visit the Forestry and Wildlife Club's UConntact page. The Horse Practicum is a self-improvement, non-credit, extracurricular horse riding program. Students enrolled in the practicum program can participate in riding lessons and in the care and management of UConn horses. The Practicum is open to all students enrolled at the University with priority given to Animal Science majors. Practicum students may choose from Huntseat, Western, Dressage, Saddleseat (by arrangement), and Polo. Beginner, advanced beginner, intermediate I & II and advanced classes are offered. Students must pay a fee in order to participate. For more information, call the Animal Science department at (860) 486-2413. Visit the Horse Practicum website. The Horticulture Club promotes interest in horticulture by sponsoring social, educational, and volunteer activities. Membership is open to any student with an interest in horticulture. Activities include an annual Horticulture Show, Cornucopia display and sales, mini-holiday tree sale, Valentine’s Day rose sale, Mother’s Day plant sale, volunteer activities, speakers at regular meetings, and an annual banquet. The club takes educational trips to Longwood Gardens, Garden in the Woods and Arnold Arboretum. The club sponsors a presentation by an “Outstanding Horticulturist” and a display at the Hartford Flower Show. The club annually contributes up to $1000 towards the Horticulture Club Scholarship endowment. Visit the Horticulture Club's UConntact page. Husky Sport pairs UConn students with students in schools in Hartford's north end. Using sport as common ground for learning, Husky Sport has instilled the importance of service to community in every participant. Visit Husky Sport's UConntact page. The Nutrition Club is an organization composed of students interested in the field of nutrition. While a majority of club members are undergraduate students majoring in Nutritional Sciences, membership includes students in other nutrition-related disciplines. The club serves as an excellent means of meeting peers and developing friendships. Participation in club activities conducted throughout the academic year fosters leadership, enhances communication skills, and establishes the importance of professional service. Annual activities include Relay for Life, attending a professional cooking class, National Nutrition Month projects, University of Connecticut Health Fair booth-sponsorship, career seminars, and general departmental service. Visit the Nutrition Club's UConntact page. The UConn Outing Club is composed of a group of people who enjoy pursuing outdoor activities. These activities include backpacking, hiking, climbing, biking, kite-flying and kite-surfing, kayaking, snowshoeing, cross-country skiing, mountaineering, spelunking, and just about any other outdoor activity that interests the club's members. Gear is provided for participants who lack the proper gear necessary to pursue these activities. The Outing Club is a good place to make friends with people who share similar interests. Visit the Outing Club's UConntact page. Paws and Claws is an organization open to undergraduate students of all majors whose mission is to promote the welfare of animals. Through various events throughout the semester, they aim to facilitate the adoption of animals in shelters, increase awareness about animal-related issues and make contributions to shelters and animal establishments. They have guest lecturers and professionals speak about topics that members want to hear more about, and host events on campus and in surrounding areas. Visit the Paws and Claws UConntact or Facebook page, or email them at uconnpawsandclaws@gmail.com. The Polo Club is made up of members of the polo practicum and the varsity polo teams. The polo practicum provides basic and advanced instruction in polo techniques and strategies. The Department of Animal Science maintains approximately 20 horses for use in the polo practicum program. Advanced polo players may try out for the men’s or women’s polo teams. The polo teams compete in regional and national tournaments and are members of the Northeast Intercollegiate Region. Visit the Polo Team website. The Poultry Science Club is open to all students with an interest in poultry or the poultry industry. The highlight of the year is an annual trip to Atlanta, Georgia to the International Poultry Exposition and Trade Show where students combine attendance at this outstanding event with job interviews. The club sponsors dinner meetings and outings to the Little Rhodi and the New England Poultry Show. The club has sponsored a state-wide 4-H poultry contest and raised show birds for entry into local poultry shows. Fundraising activities for the club have included the sale of poultry products at a country music festival and turkey processing in the fall. 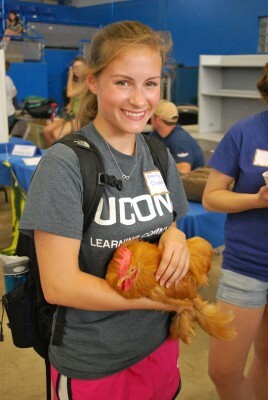 Visit the Poultry Science Club's UConntact page. The Pre-Vet Club is open to any UConn student interested in veterinary medicine. The club sponsors trips to veterinary colleges, zoos, and aquaria; it invites veterinarians and veterinary school representatives to speak at meetings. Our main fundraising events include the Fall and Spring Dog Washes. We attend the annual American Pre-Veterinary Medical Association symposium which allows members to attend a variety of lectures and labs focused on significant topics in the veterinary field. Our club has grown immensely in the past few years and we look forward to continuing to find new ways to learn and gain experience in the veterinary field. We are always open to new guest speakers, trips, volunteer opportunities, and encourage our members to make suggestions! Visit the Pre-Vet Club website. The Real Slow Foods Club at UConn (RSFU @ UConn) is a combination of the Slow Food Movement and the Real Food Challenge. They aim to improve the culture of food on campus by coming together to enjoy and promote whole, healthy, organic, local, and fair trade food. They are a nutrition and natural resources focused club that advocates for appreciating food and where it comes from by educating, watching documentaries, doing farm tours, and more. Visit the Real Slow Foods UConntact page. Sigma Alpha is the national, professional and social sorority for women in agriculture. As Sisters in Agriculture, we are a close knit sorority that emphasizes friendship, agricultural awareness, and community service. The purpose of Sigma Alpha is to promote women in all facets of agriculture and to build friendships among them. Members are encouraged to strive for achievement in scholarship, leadership and service. Membership is open to all women at the University, whom have an interest in agriculture and related fields. Sigma Alpha is also a service sorority, with several community service projects throughout the year. Visit Sigma Alpha's website or UConntact page. The objective of the Student Chapter of the Soil and Water Conservation Society is to advocate the protection, enhancement, and wise use of soil, water, and related natural resources. The chapter typically meets every two weeks during the semester to discuss planned activities. One popular activity has been a trail maintenance weekend each semester. During the week members hike a trail and determine the maintenance needed. The following weekend, the trail is picked up, bridges are built, and erosion controlled. Other activities include inviting speakers and participating in Clean-Up Week at UConn. One of the greatest advantages of the chapter for students is interacting with professionals in the field. There is a close link with the Southern New England Chapter whose members are working professionals. Chapter officers have the opportunity to attend national meetings of the Society. The Turf Club provides networking opportunities for students who have an interest in turfgrass utilization such as golf courses, athletic fields, commercial and residential lawns, sod production, erosion control, and conservation areas. It also serves as the student chapter for various professional organizations, including the Sports Turf Managers Association (STMA) and the Golf Course Superintendents Association of America (GCSAA). During the academic year, members of the Turf Club have the opportunity to attend various turf-related conferences, trade shows, listen to guest speakers, and network. Other activities include site visits to selected golf courses, athletic facilities, sod farms, and other distinctive landscaped areas where turfgrass is important. Members of the club gain knowledge of the turfgrass industry while having fun and collaborating with fellow students. Visit the Turf Club's UConntact page. UCATS is the student organization for the UConn Athletic Training Program (ATP). The organization is student run and students are encouraged to become a part of the organization once admitted into the ATP. The mission of UCATS is to promote the athletic training profession by providing services to the community and supporting athletic training students in their efforts at UConn and beyond. Visit UCATS website. UConn-SBA is a student run organization dedicated to providing its members with first-hand experience in the sport industry along wtih tremendous opportunities for professional networking. The mission of UConn-SBA is to connect members with unique opportunities in sport business through various initiatives including guest speakers, group outings, networking events, and involvement in the local community. Visit UConn-SBA's UConntact page. UConn Woodsmen teaches students to gain confidence and compete in lumberjack sports, which require accuracy, precision, and endurance in a safe and clean environment. Team members compete with students from other universities in events, such as two-person cross-cut sawing, bow sawing, axe throwing, underhand chopping, vertical chopping, log rolling, and pulp toss. Visit the UConn Woodsmen's UConntact page. The Western Team is a close knit UConn club sport that focuses on the improvement and development of western riding in horsemanship style competition. We compete across Connecticut and Massachusetts as part of the Intercollegiate Horse Show Association (IHSA). Tryouts are held in the beginning of the fall semester and practices are held through the horse practicum. We are a close knit team that meets monthly, and secures friendships through monthly meetings, team dinners and clinics. Visit the Western Team's UConntact page. The Wildlife Society is an international nonprofit scientific and educational organization serving professionals in all areas of wildlife conservation and resource management. The Student Chapter of the Wildlife Society introduces this professional society to the student. Membership in the chapter cultivates academic, social, and career interests. The chapter provides student/ professional interaction through cookouts, field trips, conclaves, guest speakers, fund raisers, research projects, and other activities. Chapter members participate in wildlife related activities, promote professionalism, and are informed about employment prospects. College credits can be applied towards the Wildlife Society’s certification program in obtaining certification as an Associate Wildlife Biologist or Certified Wildlife Biologist. Membership in the student chapter opens a window to one’s wildlife or natural resources future. Visit the Wildlife Society's website.